The vote was unanimous. 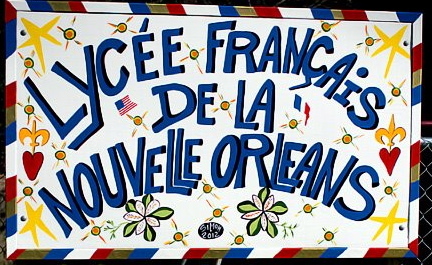 Board members for Lycée Français de la Nouvelle Orléans on April 2 agreed in a public meeting to accept the resignation of founding principal and school leader Jill Otis. But what the dozen or so onlookers gathered during that meeting probably didn’t know was that for days leading up to this decision, board members had been emailing one another — in violation of Louisiana’s public meetings law — to discuss how to force Otis from her post. On March 27 and 28, emails obtained by The Lens show, the board discussed whether it would offer Otis severance in exchange for her quiet resignation. “I appreciate the fact that you are trying to organize your thoughts prior to the meeting with Jill,” board member Jean Montes wrote early on March 28 in an email to six other board members, before going on to list four different ways the board could either demand Otis’ resignation or terminate her. Within six and a half hours, a majority of the board agreed, one email response at a time, to present Otis with an attorney-crafted statement prior to their scheduled April 2 board meeting. The proposal offered Otis an emeritus title and “pay through the end of the official school year, June 30, 2012” in exchange for her immediate resignation. “I am in support of this message,” Montes wrote. “Ok,” board member Paige Saleun responded. “I think the statement is fine,” board members Hemalatha Banagada and Thomas Klingler each wrote. “Ok by me,” Allen Kelly said. Now, auditors have cited the financially struggling school for paying Otis nearly $30,000 through mid-July without board approval or a written contract. That’s because the board never voted on the matter during a public meeting, records show. When questioned by The Lens, current Lycée board president Jean Montes on Friday acknowledged his board had violated public meetings laws during the March email exchange, but suggested the board’s subsequent actions made the illegality inconsequential. “We cured the violation on April 2, 2012, during an open meeting where the Board entered executive session to discuss this particular personnel issue,” Montes told The Lens by email, saying he consulted with the board’s attorneys at Adams and Reese law firm regarding the matter. While public school boards do have the option of discussing certain matters in private, Louisiana’s open meetings law requires the public be made aware of these executive sessions and that the board excuse themselves during a publicly called meeting. On top of that, the law prohibits public bodies from taking any action during the closed-door sessions, requiring boards reconvene before the public to do so. For months, Lycée’s board has been the subject of complaints involving lack of transparency. One group of parents went so far as to secure an attorney and detail a lengthy list of concerns about the board’s governance in a letter they sent to board members, school faculty and state officials. In December, over the objections of news reporters, board members closed a meeting involving board members to anyone who was not part of the Lycée “family.” John White, the state’s school superintendent, soon after intervened on the school’s behalf, asking his staff and the Louisiana Association of Public Charter Schools to help Lycée find a strong leader. Caroline Roemer Shirley, executive director for the charter schools association that is working with the school, regularly stresses the need for transparency among charter boards. Despite that advice, Lycée officials as recently as last week still seemed to be struggling to comply with the demands of open government. In January, The Lens raised questions about the circumstances of Otis’ resignation and requested any documents related to a severance package for her. That same night, the school issued a media release in which it announced it would not seek reimbursement for the $30,000 the school paid to Otis. The statement doesn’t even hint at the fact that, according to emails, Montes not only supported paying Otis a severance and giving her the option of staying on with an emerita title through the end of the school year, he suggested it. 4. If she chooses not to part ways amicably she will be terminated as of the next board meeting. Of the board members involved in the March emails, Montes, Banangada, Saleun and Catherine MacPhaille still serve on Lycée’s board. Thomas Klingler, Ken Charity and Andrew Abrams all resigned in the months that followed. Abrams sent the board members the old emails in response to Lycée’s media statement that he was the one who arranged to pay Otis following her resignation. The Lens emailed each of the seven board members involved in the March email string, asking about the content and their involvement conducting board business by email. Only Montes and former board members Abrams and Klingler responded. “I did not know that the email exchange in question was in violation of state open meetings law,” Klingler wrote in an email to The Lens. Klingler said that while the email string was representative of the board’s communication concerning Otis’ resignation, he believed the board was being guided by its attorney. Throughout the process, Klinger said — from Otis’ evaluation until her resignation — board members consulted with attorney Justin Schmidt, also of Adams and Reese. “I believe that the fact that the board’s attorney participated in and facilitated these discussions gave the board confidence that what we were doing was within the law,” Klingler wrote. Abrams, too, said board members felt confident they were acting in compliance with the law because “the board’s attorney participated in and facilitated these discussions.” Abrams noted that he was only copied on the March 27 and 28 emails and did not engage in any deliberations with the rest of the board. Today, records show, Lycée has a contract to pay $290 per hour to Adams and Reese for legal services — services school officials said range from facilitating the school’s public records requests to representing board members in a lawsuit filed by a former teacher. Documents say that rate may fluctuate from $185 to $500 per hour, depending on which of the Adams and Reese attorneys do the work. Montes said that while the emails may have constituted a violation of the state’s public meetings laws, he doesn’t believe The Lens should publish them. Otis declined to talk with The Lens about the emails or the $30,000, but did say Monday that she planned to meet with her attorney. The Lens is publishing the emails so that readers can draw their own conclusions about the intent of the board regarding Otis’ resignation. About 76 percent of public school students in Orleans Parish attend charter schools, most of which are overseen by self-appointed boards. Though not elected, all of these boards operate as agents of public funds and are required to follow the law when it comes to holding open meetings and complying with public records laws. Despite the issues Lycée is having in this regard, Montes said he recognizes his board’s duty to communicate with the public in a manner that upholds the law. Editor’s note: This story has been updated to include responses from former Lycée board member Andrew Abrams, who responded to The Lens’s questions after the original story had been published. It also includes an additional email string from March 30 which Abrams provided in answer to questions.